I’m actually making a little progress with my #projectcrochet goals for this month. 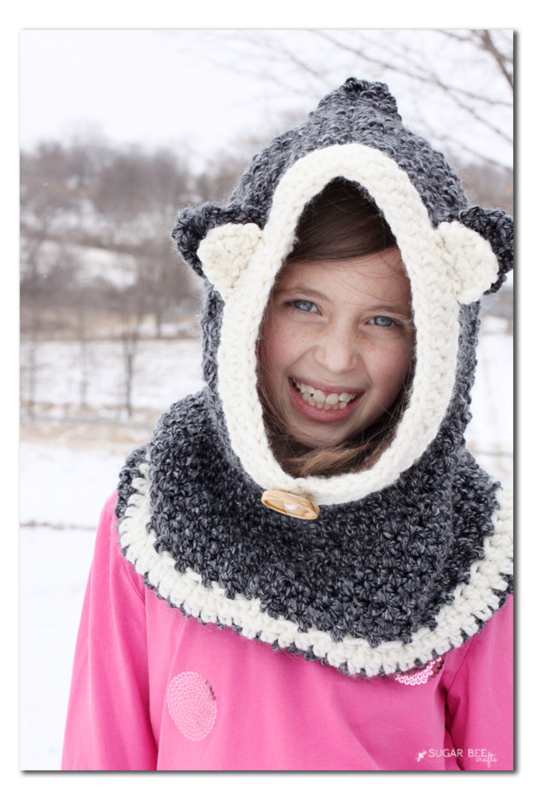 Remember, on my must-make crochet projects list, I had the Flint Fox Cowl – – well, check it out!! I did it!! 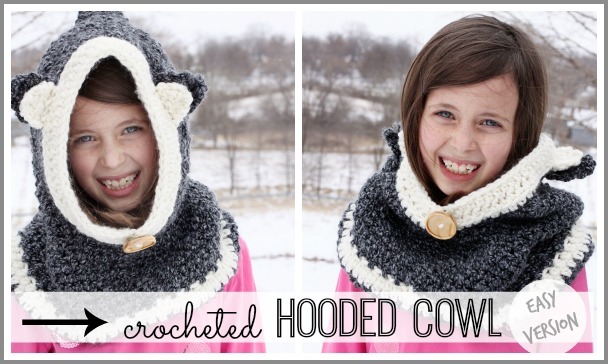 Just like that, a crocheted hooded cowl! Remember my goal for this round is to try to stretch myself just a little – which means easy patterns, but they’re actually patterns so I have to force myself to figure out how to read them. 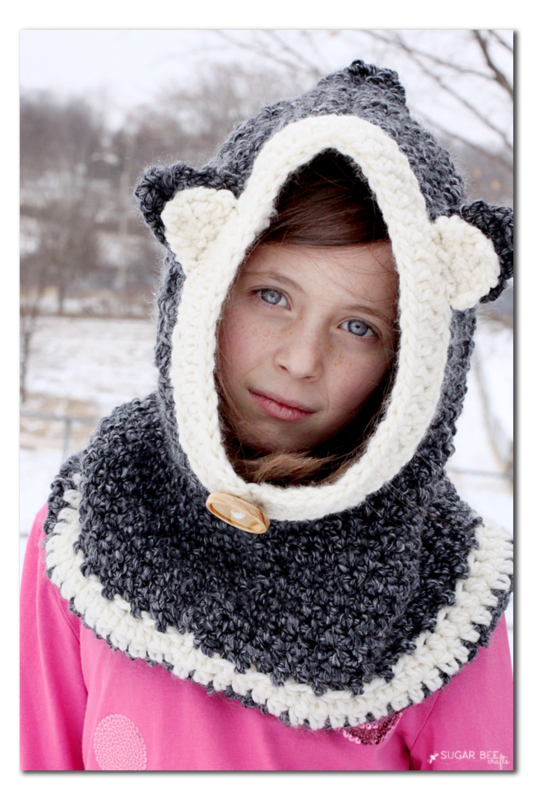 My 8 year old even busted out the “serious face” to try and match the pattern photo 😉 I love that it can be worn as a hood, with the hood up, or as a cowl, with the hood down. Mine does have that bottom strip of main-yarn under the white strip, but it must have flipped up for the pictures. It was a little tricky, switching between two types of yarn (the white is more dense, and the gray has a lot of fluff and give) so where they met it was sitting just a little weird. I purchased the pattern from Raverly – it’s the first crochet pattern I’ve purchased, vs finding a free online tutorial, but it was just calling to me so it was worth it. I would say an ambitious beginner could figure it out. There were a few parts that were a bit confusing to me, rows where you crochet in the back loop for one stitch and then the front loop for the next stitch and repeat. My yarn was pretty chunky so that made it kind of tricky. So I came up with an easy version – you just follow the pattern, but do regular crochets instead of the front loop back loop thing. That’s what I ended up doing and it worked. It doesn’t have quite as much visual variation or texture, but I’m totally okay with that. How are your crochet projects coming along?? All month long, use hashtag #projectcrochet on social media so we can see what crochet project you’re working on! 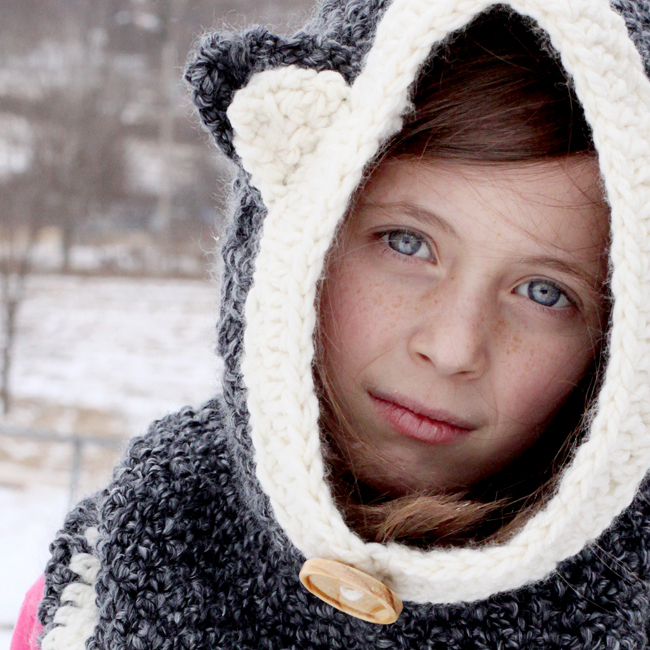 you can find the pattern here: http://www.ravelry.com/patterns/library/flint-fox-cowl – – good luck with it! 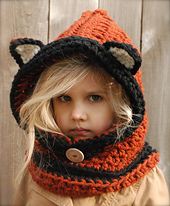 Good morning, I just received an order for the flint fox cowl. My customer saw your post and liked your version. Thanks for sharing. 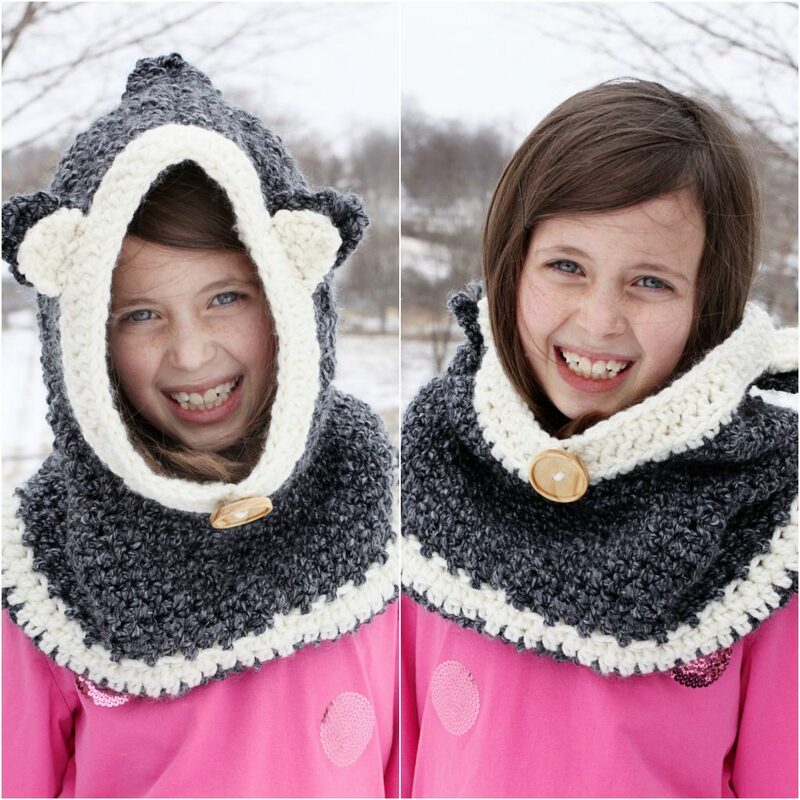 I have purchased the pattern from HeidiMay and am on my way to the store to get the supplies. I hope mine turns out to be as nice as yours. Where is the easy version of the pattern. I am unable to get to it.